This year’s event has added even more dates to experience Christmas Town attractions, shows and shopping. Christmas Town is open 23 select dates and park closing times will range from 8 p.m. to 9 p.m. throughout the event, Nov. 28 through Dec. 31. 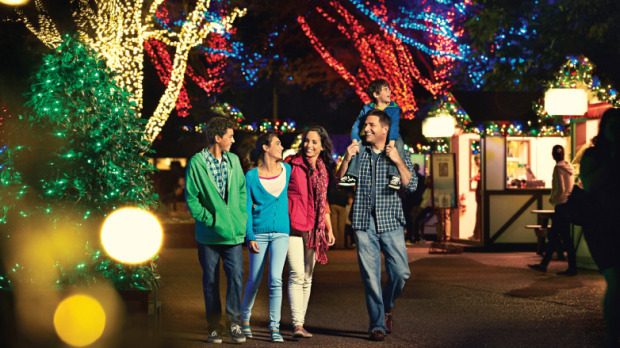 From the nostalgic Holiday Hills to the nature-inspired Jungle Jubilee, more than a million lights will blanket Busch Gardens during Christmas Town. Plus, fan-favorite shows including Christmas on Ice and the Carol of the Bells light show return to ring in the season. • Dazzling lantern stars transform Pantopia into the jewel-toned Celestial Crossing, complete with a gigantic LED star that lights the way to Mrs. Claus’ Family Feast and the Christmas Celebration show. The new area is also home to the Bottle Christmas Tree, a conservation collaboration project that transformed 5,000 recycled plastic bottles into a Christmastime masterpiece with the help of nearly 50 Hillsborough county schools. • The Egypt area of the park transforms into the town of Bethlehem, where guests discover the famed journey to the Three Kings. The story unfolds as the North Star guides the way to a land filled with desert-themed rustic décor, larger-than-life camels and the Three Kings Caravan. • The Claus family invites you into their North Pole home at Welcome to Santa’s House. While the elves are busy preparing for Christmas, Santa is taking a break from his busy holiday schedule to meet and take photos with families in his private study. • All aboard the Christmas Town Express for the biggest Christmas carol sing-a-long on wheels. Friends and family are invited join in singing traditional songs of the season like “Jingle Bells,” “Frosty the Snowman” and “Rudolph the Red-Nosed Reindeer” while circling the Serengeti on a vintage-style steam locomotive. • Busch Gardens is excited to welcome African penguins to the family! Come chill with these little creatures and marvel at their underwater antics at the brand new Penguin Point, complete with a giant penguin photo opportunity in the Nairobi area. • For those who can’t wait to get their night at Christmas Town started, guests are invited to pull up a seat at Mrs. Claus’ Family Feast for a special evening filled with stories, songs, a delicious holiday fare, plenty of opportunities for holiday hugs and photos with Mrs. Claus and her favorite elves. Space is limited for this exclusive dining experience and reservations must be made in advance at ChristmasTown.com. Christmas Town will also offer some new opportunities for groups looking to book a unique holiday party. For details, call the Busch Gardens Events Team at 813-987-5523. For more event information, visit ChristmasTown.com.